OK, the cell phone did not ping by Waterford, LE says that text would be bogus. good minds and all that nice stuff. yeah yeah. i know. i crack myself up. just me myself & my weird simple personality. lol! Brandi, did you see anything about the police confirming the truck spotted on that neighbor's security cam definitely wasn't Michelle's? From what I read, they worded their statement with the media carefully. I don;t know if I'm missing something. If they already truly confirmed it wasn't her truck in that video, I don;t wanna concentrate on it. I'm reading on the net, several blogs I just skimmed over including WS, and most are stating it as a factual confirmation that it wasn't Michelle's H3 spotted on that security cam exiting the condo complex. Kinda confusing, but it's the only article I have found on this matter. State Road 408 (East-West Expressway) has tolls. When Ironhorse & his passenger saw Michelle's H3, it was in the vicinity of 417 & Alafays Trail heading East. Ironhorse said he believes her H3 exited the 408 maybe toward the North. There has to be a security camera there. So basically he's saying she exited the 408, which means she was driving on the 408, which means she paid toll. There's gotta be a toll calculator for ezpass. I used to live there...for 7 1/2 years. Hmmm... Isn't it funny how they word things? Plus, did you notice this story is dated today? Threw this together just now. Also, Nancy Grace is covering her case right now. Parker's family has conceded that Smith's relationship with Parker was volatile, but they have also said that Smith is a dedicated and loving father who cares for Parker, even when they don't get along. Mitchell was one of many topics of conversation between Parker and Launer when they got together the night before Parker disappeared. Launer said that nothing seemed wrong with Parker when she saw her Wednesday night. Parker had made plans to have an oyster dinner with her dad on Friday night and the friends had planned a bonfire for Saturday so that Launer could meet Mitchell for the first time. When Parker's brother Dustin texted Parker to ask where she was, he got a response immediately. It was one word: "Waterford." This message triggered a red flag for Launer. "She would never have texted back 'Waterford.' Her texts are a book. In every text that she would send, she would have xo's, smiley faces, hearts," Launer said. "I personally do not think that was from her, not at all for one second, because she wouldn't have said that." Launer describes her friend as a dedicated mother and hard-worker who juggled three jobs to support her children, bartending, working a tanning business and as a hair dresser. Thanks Brandi. Anything new said on NG? Michelle was a well known bartender. She cut hair. She has a mobile spray tanning business. She's adorable with a great personality, she & Dale maybe just didn't mesh together. I'm wondering if she had a stalker. Police don't need her cell to pull records from her cell company for incoming, outgoing calls & texts. This is now a huge investigation. Have they pulled warrants yet for her cell company? Or are they gonna wait 31 days? "She would never disappear and put her kids through this," Parker's longtime friend, Angela Mann, tells PEOPLE. "Her kids are her entire world. 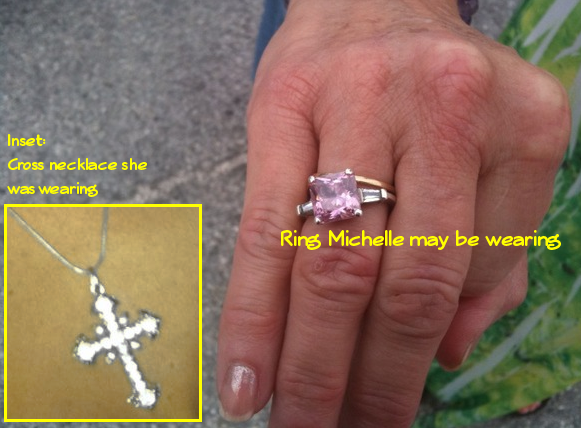 Anyone who knows Michelle knows that she did not voluntarily disappear. Somebody took her." Snipped your post to discuss this quote from the article. BBM above. Michelle stated on The People's Court (that was filmed 5 months ago) that Dale was not visiting the kids and even missed their birthday. Another example of the family talking nice about Dale, IMO. I thought I read 4 months? I must have read 4 weeks or something.